Twelve families will be traveling to Breckenridge next week to take part in the Wounded Warriors Family Ski Week, hosted for the sixth year by local nonprofit organization Wounded Warriors Family Adventures. The weeklong event benefits veterans of the Iraq and Afghanistan wars who have been severely wounded in combat, as well as their spouses and children. This year’s participants were chosen out of a total of 80 who applied and will come from all over the United States, including Washington, Michigan, Maryland, Florida, Louisiana, Texas, Arizona, California and Colorado. Throughout the week, the soldiers and their families are given ski lessons by instructors at the Breckenridge Outdoor Education Center (BOEC) and attend counseling sessions with professionals from the Aurora Mental Health Center. The ski lessons give the families time being active in the outdoors, while the counseling sessions offer the opportunity to work through issues with professionals and people who have gone through the same experience nearby. The entire week, including lodging and airfare, is completely free for the families. “We are so excited about what we are able to do,” said Bob Miller, who has been the event chairman for the last five years. The aim of the program, he said, is to provide three things – the opportunity to ski, the opportunity to speak to mental health counselors and the opportunity to set up a network of friends who are going through similar experiences. Certified adaptive ski instructors from the BOEC spend time with the families all week on the slopes. 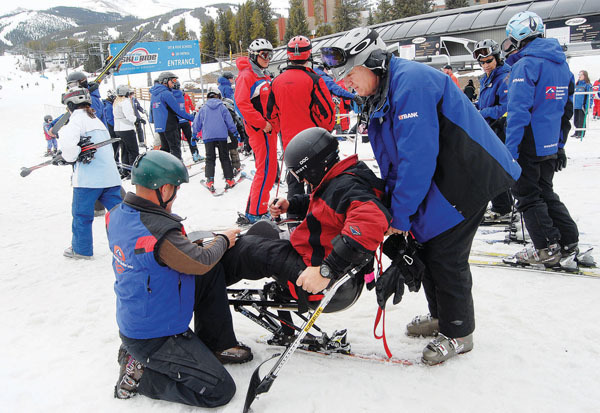 On the first day the veterans, whose injuries range from amputations and spinal cord damage to traumatic brain injury, are fitted with adaptive ski equipment before being taken up the mountain. The mix between personal accomplishment and the ability to have fun with family are the main opportunities afforded by the skiing portion of the program. Most of the veterans and their family members have never skied before, or are beginners in the sport. However, by the end of the week they will have begun to see improvements and have started making their own way down the slopes. Especially for the wounded soldiers, who were previously living very active lives, the speed and excitement of snowsports brings the thrill back to outdoor recreational activities. “You see a lot of emotion involved,” said Schappert, who recalls one time when a wife burst into tears after she and her husband reached the bottom of the hill. They were tears of pride, not only for her husband’s accomplishments but for her own as well. The counseling sessions, which usually take place in the mornings before skiing lessons, have been successful, said Miller. Several years ago, counselors were also brought in for the children in the family, which received a positive response. At the end of each week, the families usually create a project to memorialize their time in the mountains. In past years, they drew pictures or created tapestries. This year, however, they will be doing something different. Motivational speaker Peter Himmelman is flying out from California to donate his time to speak with the families. He’s also a guitar player and is going to work with the couples to create songs together. “He said he’s had great success with motivating people and improving communications and teamwork, and helping people get through difficult issues in their lives if they can verbalize that,” Miller said. After writing their lyrics or poetry, the couples will work with Himmelman to put their words to song and perform. Miller said he is looking forward to seeing the results from this new activity. One of the biggest benefits of the family weekend, Miller said, is connecting the families with people who understand what they are going through. After leaving the military service, he explained, it’s not unusual for soldiers to move back to near their hometown, or near family, into communities which might not have a military presence. Following on the success of the program, Miller said that the Wounded Warriors Family Adventures organization is looking to launch its first summer program this year, bringing in more veterans and their families to enjoy the fishing, rafting, hiking and biking opportunities of Summit County. “There’s a lot of demand out there,” Miller said. He also praised the support that the program has received from the people of Summit County.